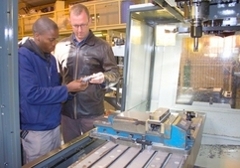 After 15 years’ hard work and a lot of sweat in advanced manufacturing training, the Engineering Faculty of the North-West University’s Potchefstroom Campus has now been appointed as the first tertiary institution that is involved with the practical training of students of the NTIP (National Tooling Initiative Programme). The NTIP is an initiative that is funded by the government and which trains craftsmen as toolmakers. He says the aim of the government’s Skills Development Programme is to address the shortage in skills that South Africa currently experiences and thus also to reduce job losses. The massive needs in skills of industries will also be better addressed by this initiative. The Department of Trade and Industry has just released a new list of scarce and critical skills, amongst which many that fall under the engineering and manufacturing industry. They are of the opinion that the shortage in skills remained the same over the past decade, and in some fields of study it even showed a bigger shortage. The country specifically has a massive shortage in trained tool-makers. The NWU’s pilot project entails that 36 students attend an advanced course for three months. Besides the infrastructure and equipment needed for their training, the government funding also covers accommodation, transport and meals.